Some trends are better left for others to follow, and we'll be doing our own thing. This is what high-ranking HTC operatives must have said at some point during the development of the company's latest high-end smartphone. So here we have the HTC U12+ with a tall 18:9 display, no headphone jack and a dual camera with 2x zoom. Wait, all these are very much current trends, so what was that first sentence all about? You see, there's no notch on the U12+. Going by the numbers, the notchless display is the same as last year - a 6-inch Super LCD6 with QHD+ resolution in an 18:9 ratio. This time, however, it's got a tick in the HDR10 compliance box and should also display the DCI-P3 and sRGB color spaces. So it's not the same then. The U12+ is actually HTC's first modern-day global flagship with a dual camera, and this time it's a proper one. After its pioneering efforts in the field (the One (M8) and its depth-only second cam) didn't exactly take off at the time, HTC is now playing catch up, sort of. Building on top of the already excellent U11 12MP shooter, the U12+ adds an extra 16MP telephoto module for 2x zoom and the all-important faux bokeh (yes, the One (M8) could do that too, back in 2014). 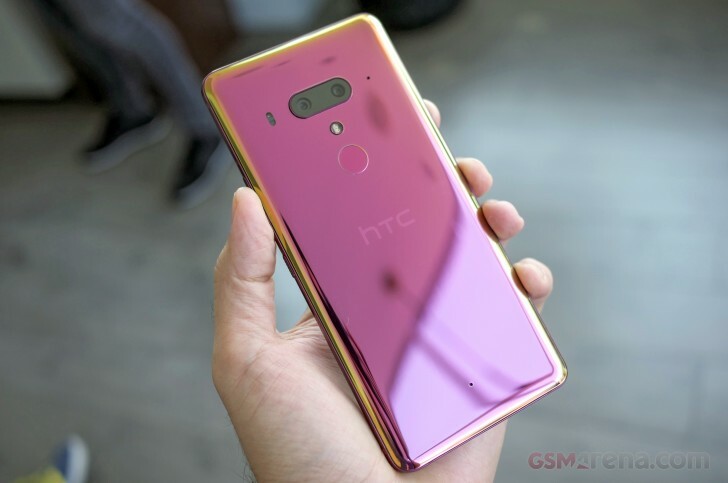 Not content with its trailing dual-camera position, HTC out-dualed the other big names and fitted a pair of cams on the front as well - two 8MP ones. The default Android flagship chip for 2018 can be found inside the U12+ - Qualcomm's Snapdragon 845, and with 6GB of RAM and at least 64GB of storage (which is also expandable), you won't be strapped for gigabytes. Oddly enough, battery capacity has been reduced compared to the U11+ - it's now 3,500mAh (vs. 3,930mAh on the outgoing model). With the U12+ HTC has taken further strides in its attempts to make squeezing your phone cool. Edge Sense 2 it's called, and we'll need to spend more time with it to fully appreciate it, but non-clickable buttons? Hmm. Anyway, HTC was kind enough to invite us to spend some time with the U12+ and we're not really known for declining such offers. We went, we touched, we took photos, we'll be sharing them now.